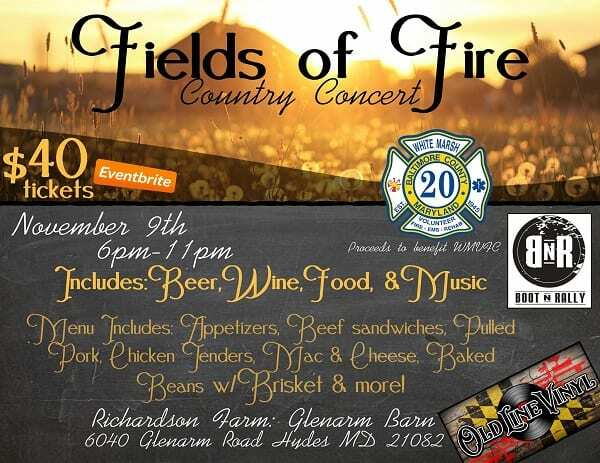 A fun concert will be coming to Glen Arm in November, and all proceeds will benefit White Marsh Volunteer Fire Company. Country bands Old Line Vinyl and Boot N’ Rally will be performing at the Richardson Farms Glen Arm Barn on Friday evening, November 9, 2018. The event will run from 6 to 11 p.m. Advance tickets cost $40 each. Limited tickets will be available at the door for $50. Food will be provided by Richardson Farms. Specialty liquor drinks will be available for additional costs. 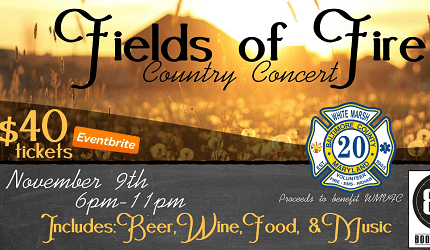 All proceeds will benefit White Marsh Volunteer Fire Company. Richardson Farms Barn in Glen Arm is located at 6040 Glenarm Road, Hydes, MD, 21082. For more information or to purchase tickets, visit the event page on Facebook here.